In honor of mine and Bob's anniversary today (27 years and counting), I thought it was time for a little give away to add to the fun! ...Now I'm off to celebrate the day! The five little pumpkins seeds that we planted in Elsie's little garden digging bed of course have decided to creep all over the garden. And being happy, this is what the pumpkin vines are giving me in return! We'll see how these little guys like growing on the hard bricks. In another box, my tomatoes are starting to really produce! We had a wonderful pasta sauce earlier this week, and I'm already collecting some more. Pure Summer! In my quest to reduce The Pile this year, I had gotten Jean McDonald to quilt this one for me. Jean works on a Gammill Longarm and she did beautiful free motion feathers in the triangle squares, that I could not have done nearly as nicely. I finally got it bound this week, and I even had the forethought to put a hanging sleeve on the back! I love feathered stars of all kinds, and this one will hang in our living room during the Christmas season ~ It'll look great on my red walls in there. I think I'm going to put a little feathered star on the label that I put on the back. The big brown truck is on the way to Kentucky with more Mountain Baby Blankets! Char has been busy as a bee bordering, quilting and binding all of these tops that we are sending out to the kids in Appalachia. Thanks Char ~ what a feat! This shipment is comprised of ten baby quilts, ten childrens books, a fleece blanket, and a set of five receiving blankets. Heather and I had a lot of fun picking a book to go with each of the donated quilts, and tying them up like little presents :) I hope the recipients enjoy opening the boxes as much as we enjoy packing them! This weekend my best friend and I had some free time to take a ride and do a little yard saleing and antiquing. We ended up at the Westminster Antique Center and this is one of the treasures that I found. My mom had a whole set of these glasses when I was a child, and I think she had a matching pitcher. As soon as I saw this glass in a booth, I knew it was going home with me! I'm putting a little tea light in this one, and it will look great in my yellow sewing room! And my other great buy was this lovely old doily that I got at half price at The Blushing Rose Boutique (Thank you Marydon!) This booth was beautiful with lots of china and tea related items, baby accessories, and wonderful vintage fabrics. Now that I know where to find it, I'll be visiting in the future to search through these fabrics again on my quest to find just the right ones for my reproduction of my Great Grandmother's quilt. We also hit a couple of yard sales and I picked up these treasures for practically nothing! I almost didn't see these hand quilted framed quilt blocks thrown under a table. They definitely needed a home with me. There was this large bag of trims, ribbons and buttons that I got for $1.00, and at this yard sale the kiddies were having a lemonade stand ~ of course I had to participate with that! And these cute baskets will all find a home in my sewing room as well. It was a very productive morning with our treasure hunting, and we still had enough money left over to treat ourselves to a lunch at Olive Garden. So it was one of those special summer mornings with great weather, a good friend, lemonade, treasures and bargains, ending with good food. Doesn't get much better than that! When I'm in need of inspiration, I like to peruse the web. I just love to hit the Moda Bake Shop blog. They post a free project tutorial from a different designer each day that uses a Moda pre-cut product. If you've never been there make sure you check it out! There are a lot of really cool, fun & fast ideas there! 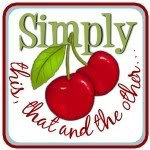 And for a great read, check out Jodi's blog Simply This, That and the Other. Jodi was recently featured on the Moda Bake Shop for a wonderful use of the Moda Turnovers. In honor of this, she is having a give away that you can sign up for before August 3rd. I'm a frequent reader of Jodi's blog, she posts great pictures and is a very creative blogger. Go ahead, peruse and be inspired! Last night at the shop I had the best visitor. Rita from New Jersey stopped in with her mother-in-law after their trip down to see the Needleart Exhibit at Montpelier Mansion that I blogged about the other day ~ And she brought show and tell! Above is her Heartfelt Welcome quilt in yet another colorway than the ones I showed yesterday (which was really neat to see). Rita and I seem to like pretty much the same things. Here is her Jo Morton Holiday Inn quilt. She did a beautiful blanket stitch on the applique, and I love the outer border fabric. She also showed me her collection of Baltimore Album blocks (she has nine of them completed ~ just like me), but in our chit chatting, I didn't take pictures of them. And last but not least, I did get a photo of this cute little quilt done in 30s fabrics called Chubby Chicks from Black Mountain Quilts. It's so nice to meet quilting friends, especially when you have so much in common! (Thanks for making my day Rita, I hope you had a safe trip back home!) There's not much better than new quilting friends and show & tell! Yesterday was the Sloanies day at the shop and Ruth Green brought in a couple of her finished quilts for us to see! The cute one above is called A Slice of Summer. The pattern can be found in Pat Sloan's Folksy Favorites book, and it has been released as a single pattern. This is Ruth's Heartfelt Welcome, also found in Folksy Favorites. I love Ruth's choices in color. My camera doesn't do it justice, but her colors are soft and light, and Ruth does all of her own quilting. I have done the Heartfelt Welcome top ~ haven't gotten to the quilting of it yet. My colors are darker and more similar to the colorway in Pat's book. This last set is not a Pat Sloan pattern but from a pattern called Melon Madness from Meme's Quilts. The colors are so bright and happy, and the watermelons just sing summer! Ruth does such beautiful work, I enjoy seeing everything she does and what fabrics she picks out, so I just had to share. Late yesterday the Fed Ex man stopped by the house and brought me a box that I didn't expect to be receiving until next week! It was filled with fabrics from Marcus Brothers from a line called "Love Notes" designed by Faye Burgos. This is going to be my next quilt for magazine publication. I just found out on Friday that my design was accepted, put in the fabric order, and here it is already ~ don't you just love it when things work efficiently! I have spent the early part of the week working my other job that deals with clerical work for a government consulting firm, so let me tell you this was really refreshing! I'm not generally a gadget gal, doing most of my work in pretty traditional ways, but there are a few simple tools that I have come to love and just couldn't do without. One is my Clover Desktop Needle Threader. My eyes aren't as good as they used to be, and since I do most of my handwork in the evenings in my easy chair, I keep one of these right on the table next to me. As a matter of fact, I have three of them ~ in various colors ~ don't they just look like candy, you can even find them in chocolate brown! 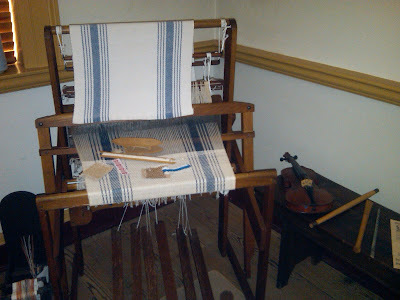 I keep one in my sewing room, one downstairs by my chair, and one in my handwork bag that I travel with. That may be a little overkill, but I don't have to search for one when I need it, and I've collected them over time. Clover has not paid me or given me anything for free for saying this ~ I just take pleasure in my little colorful needle threaders and they work great. It's amazing how such a simple little thing can make your life so much easier! It was a beautiful summer afternoon and a chance to spend some mom and daughter time, so Heather and I headed here yesterday. The temperature was perfect, with just a light breeze. 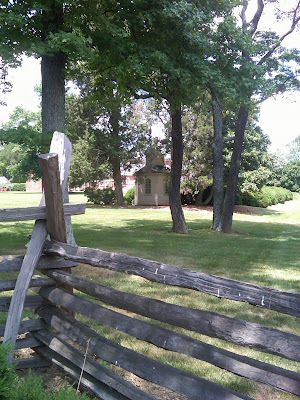 As we arrived and started our walk to our destination, on the way we saw this rare surviving 18th century summer house. 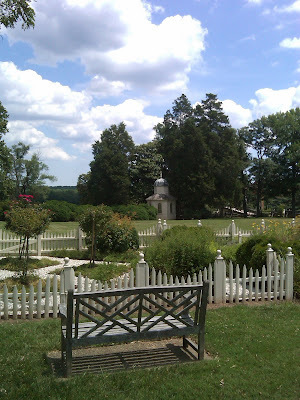 As we got closer, there was this lovely garden on the grounds, and you know me, if there is a gate I just have to enter it! These guys greeted me. 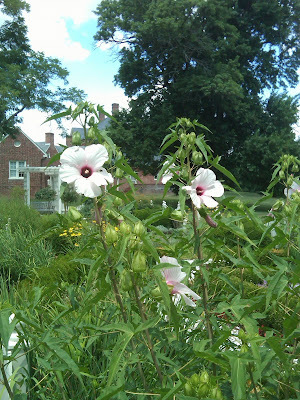 I think they're Hollyhocks? Someone correct me if I'm wrong. 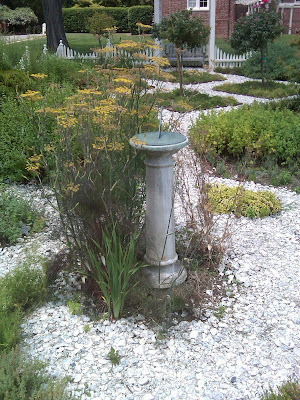 I loved this birdbath, with clam shells in the bottom, it's empty right now as we are in real need of some rain. But these little purple beauties were just gorgeous, so someone is taking good care of them! 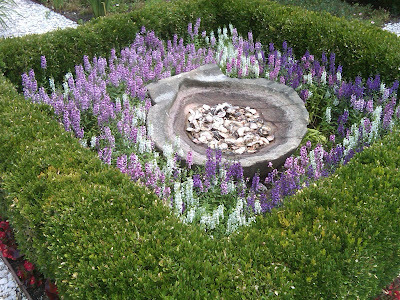 I had to take a picture of this little focal point as this is what I want to put in the center of my garden. I already have a little sundial, and have been looking for just the right thing to sit it on. The paths in this garden were also shells and put me in mind of Williamsburg VA.
...And this is looking back over the garden and grounds. 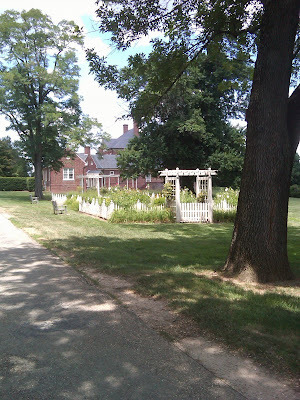 We were at Montpelier Mansion in Laurel MD. 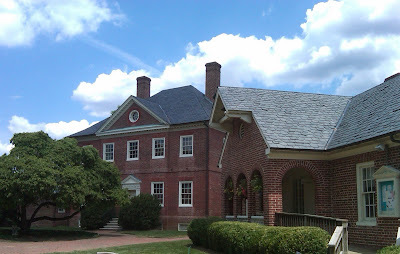 Montpelier is a home that was built starting in 1781 by the Thomas Snowden family, some of the founders of Laurel MD. Montpelier is a lovely house museum to visit on any day, a beautiful example of Georgian architecture with many rooms restored to the period, but we were here today because every year they adorn the rooms of this wonderful home with needlework exhibits. I took a few pictures inside, but as I was using my phone camera, I had some trouble with it wanting to flash when I didn't want it to, or it just wouldn't take some of the pictures that I asked it to ~ the obstinate little thing. 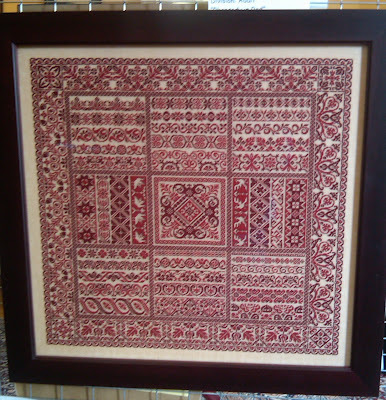 This is an awesome counted cross stitch that looks like a coverlet. I was blown away by the redwork look. 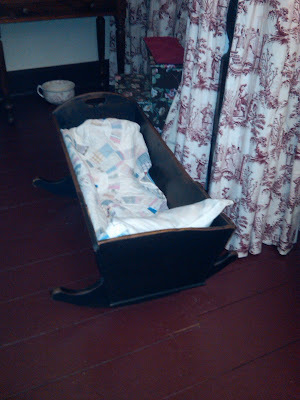 I loved this little quilt in the cradle that was in the main bedchamber. I'm not so sure that it was accurate to the period, but I liked it anyway. 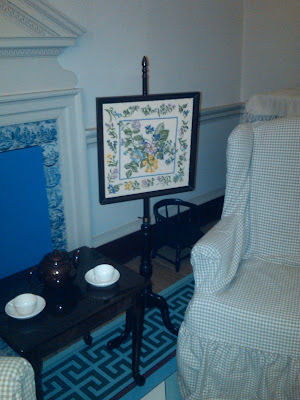 This needlework stand was really pretty and I loved the setting. They also had a sweet interactive room for children and this was in the corner. There were many more lovely museum style needlework displays throughout the house, both new and antique, and we got to tour upstairs and down. A theme this year for this 14th annual Needleart Exhibit was Samplers, so I was in heaven. Between this exhibit, and seeing the beautiful works hanging in a friend's home recently (yes Tiffany, I was totally inspired), I'm sparked to pull out a sampler that I started a while back and put away. It would slow down my applique progress, but sometimes I need a little diversion to keep moving forward (does that make any sense?). Heather even bought some patterns from a vendor that was there. Yesterday I worked an eleven hour day at the quilt shop, but on the bright side this was the scene outside my window ~ I love the setting of our shop :) Being at the shop that long, in between helping customers, I was able to work on several projects for upcoming club meetings. I got some cutting done on my next Jo Morton project, and I worked on the Thimbleberries extra project for August (pictures of these will be upcoming). Then I made a couple more of the Easy Striped Table runners out of some beautiful striped Christmas fabrics. These are so quick and easy that it's kind of addicting. This one I still need to pick out a backing and quilt it, but I'm waiting to get some black fabric that we have on order. That'll be a job for another day! Another great resource for anyone into graphic art, scrapbooking, (or if you are like me, a novice trying to play with photo programs, digital banners and such) is Dafont.com. At this site you can choose among a wonderful selection of free fonts that you can download and use (again for your own personal use). 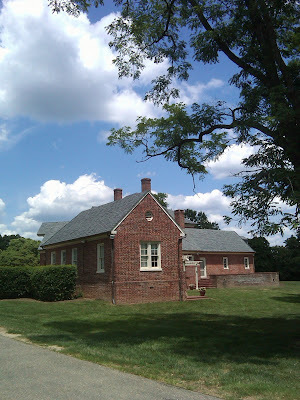 These two sites are my great finds for the week, and great places to play! So since this afternoon was a beautiful day, I came home, got comfortable in my gazebo (why not in the gazebo, right? ), and spent some quality time with my day planner, laptop, and "scribble book". This was much needed quality time, as I really had to catch up on some things and do some centering. I'm a planner and list maker and I was feeling a bit unfocused lately. Now I'm planned out for a few months and feel a little better about being able to get to everything that needs to get done. ...And with my computer time today I finally got my Etsy store up and running! I've been anxious to start selling on Etsy because I just love this site's focus on Handmade. I still have some cosmetic things to add to the store to spruce it up, and I'll be adding more items on an ongoing basis, but I'm open for business! I still have the ebay store too, and will keep the Etsy store for my finished handmade items and patterns (you can purchase Spring Water Designs patterns in either place). So check it out, Etsy is a great site! I'll have the buttons on my sidebar for ease in getting to either store anytime. "Act II ~ The Hollywood Years"